SonoSim, Inc., developers of the groundbreaking SonoSim® Ultrasound Training Solution, announced today the formation of SonoSim International to commercialize their products worldwide. SonoSim International will initially operate out of SonoSim headquarters in Santa Monica, California, and will expand into global markets via distribution partners. SonoSim products are designed to simplify ultrasound education. 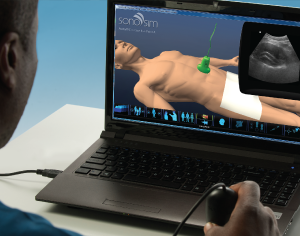 SonoSim integrates didactic courses created by leaders in ultrasound education with hands-on training, allowing users to scan over 1,000 actual patients with a broad spectrum of normal and pathologic conditions. SonoSim provides a simple and proven-effective “anytime, anywhere” solution for those seeking to learn or teach ultrasound.